It's hard to believe something that old can still be standing. 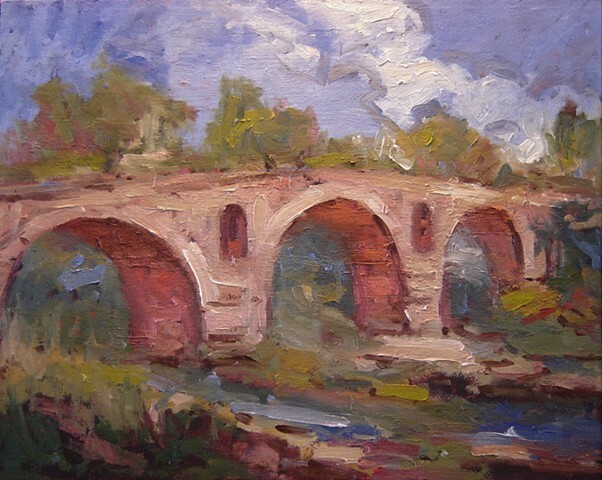 The Pont Julien is a Roman stone arch bridge over the Calavon river, in the south-east of France, dating from 3 BC. The supporting columns are notable for openings to allow floodwater to pass through. It is located in the territory of the commune of Bonnieux, north of the village of the same name, and 8 km west of Apt. Originally, it was built on the Via Domitia, an important Roman road which connected Italy to the Roman territories in France. It was used for car traffic until 2005, when a replacement bridge was built to preserve it from wear and tear. This amounts to approximately 2000 years of uninterrupted use. I liked the look of this bridge in conjunction with the natural setting, the lines of the riverbed and the structure of the clouds in the background which accents the bridge so well.